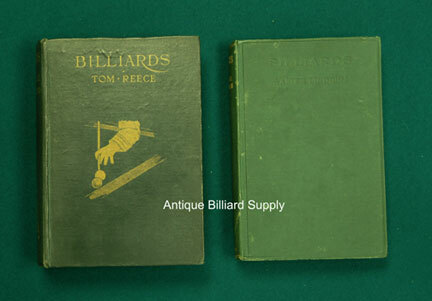 #12-08 "Billiards" by Tom Reece (left), published in 1915. It includes 84 illustrations and photographs of game situations. Includes chapters devoted to a history of the game, instructional tips and methods of practicing. 312 pages, about 5 inches wide, 8 inches tall, good condition $200. "Billiards" by Walter Lindrum (right) was first published in 1930. This third edition published in 1934 contains 78 photos and diagrams and appears to be signed by the author on the inside of the front binding. Includes instructions for breaks, position play and temperament. 149 pages, about 5 inches wide, 8 inches tall, good condition $150.